Seldom in Canadian History do we meet a figure as colourful and daring as Pierre Radisson. In 1652, as a boy of sixteen in New France he was captured near his home at Trois Rivieres and carried to Fort Orange in what is now the State of New York. He escaped, was recaptured and tortured, then rescued by an Indian family that had adopted him. Again he escaped. As so many of the young men of the French colony he was attracted by the less confining life of a coureur des bois and it is not surprising that he turned to the fur trade. In 1660, when he returned to Quebec from a fur trading expedition in the Lake Superior region, he was arrested and fined for trading without a license. Authority did not deter him, however, and the following year he set out again secretly to the north where he learned of the existence of a large body of water. This was probably James Bay or Hudson Bay. The Governor of New France being displeased at these expeditions Radisson turned to the English hoping to interest them in the fur trade through Hudson Bay. He went to England and enlisted the support of a number of English gentlemen in such a venture. The result was, in 1670, the formation of the Hudson’s Bay Company. After Radisson had shown the English the way to the fur wealth, they promptly forgot him. After all, they asked themselves, could they trust him? Had he not deserted the French? They realized, however, that such a man could be a dangerous rival and decided the best way to deal with him was to give him a pension. Radisson was not the kind of a man to be retired so easily and seeing no future with the Hudson’s Bay Company he turned back to the French. Here too he was distrusted not only because he had once gone over to the English but because he now had an English wife. To Pierre Radisson the adventure of the fur trade was the important thing. For which side he worked did not appear to concern him. He returned to Quebec and even though the Governor of the colony had granted a monopoly of the fur trade to a French Canadian company he turned his back when Radisson organized an expedition. In 1682, Radisson journeyed to Hudson Bay and started to build Fort Bourbon on the Hayes River. The fact that this was within the territories granted to the Hudson’s Bay Company did not worry him. That year while hunting near the mouth of the Nelson River to the north he came across the crew of a ship from Boston, New England building a fort. They were also planning to trade for furs in the Company's territories. The captain of the ship, Ben Gillam, proposed that he and Radisson join hands in the hunt and divide the trade between them. Radisson had other plans. 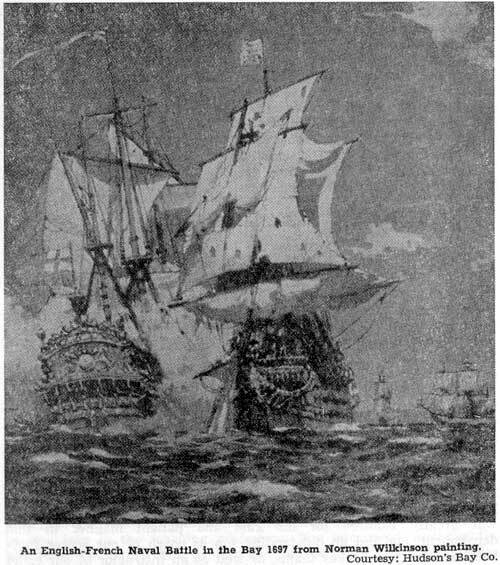 He intended to frighten Gillam away or seize his ship and he covered up his own weak position by telling Gillam that he had French ships, a strong fort and French soldiers. Gillam seemed impressed. To prevent Gillam from exploring inland and finding his fort Radisson warned Gillam about the war like Indians of the area. Believing he had frightened Gillam away Radisson traveled nine miles up the Nelson River and there to his surprise was another ship. This was a Hudson's Bay Company ship with the resident Governor of the Company aboard. The captain was Ben Gillam's father. Radisson stated that he had taken possession of the country in the name of the King of France. Again he bluffed his way telling the Governor an exaggerated story about the strength of his force and warning the party about the Indians. The Governor, too, seemed impressed. Radisson was anxious to keep the two ships from joining forces against him. If he could arrange a meeting between Ben Gillam and his father he was certain the father would prevent the Governor from coming to Gillam's fort in order to protect his son from being seized. Ben Gillam would certainly not want to go near the Governor for fear of being seized as an interloper. Radisson arranged such a meeting and felt satisfied he would be free to trade unmolested. Ben Gillam, however, had not been fooled by Radisson's tactics. He had been planning to attack Radisson and had sent out scouts to locate Radisson's fort. When Radisson discovered this he knew the only way to protect himself would be to attack Gillam's fort. He invited Gillam to visit his own fort and sent two of his men as hostages to Gillam's. When Gillam found out that Radisson had been bragging about his strength he realized that he had been led into a trap. But it was too late. Radisson had outsmarted him. The hostages at Gillam's fort had been given their instructions and when Radisson arrived the gates of the fort were open and it was his. Meanwhile the Governor of the Company had been making plans of his own. He discovered Gillam's fort but when he attacked he found himself and his men prisoners of Radisson. With both his rivals now his prisoners Radisson hoisted the French flag over Gillam's fort. Radisson's efforts for the French, however, went unrewarded. When he returned to Quebec the Governor who had permitted him to organize the expedition had died and Radisson's furs were seized. He went to France with his grievance but the French Government would do nothing. Again he turned to the English and joined up with the Hudson's Bay Company. In 1684, he sailed to Hudson Bay where he captured for the Company the posts he had taken for the French two years before. An English-French naval battle in the Bay 1697 from Norman Wilkinson painting.